Protest – Next Hipster Trend is what's HAWT, NEXT! Only Lefting: Put your Prius where your Politics are! Send a message, never turn right! Hey SJW, your mouse is bloodied from fighting the good fight replying ad nauseam to your paleolibertarian friend’s posts on the facebooks, Your solar powered fridge is full of nongmo kale pudding and microbio happy eggs and you’ve tried to give Ann Coulter a hug … but you still want more! You want to push the boundaries of your #resist -ance beyond the breaking point! We’re here to help! 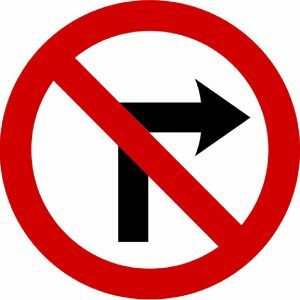 After reading about the fasco-corporatists of UPS only turning right, it’s has become obvious that the #HWTNXT protest move is to ONLY TURN LEFT! HOW2HAWT: Yes, that’s right, Only make left turns at every intersection. After extensive actual experience, the #HWTNXT science team has determined that 3 left turns will achieve the same result as 1 right turn, well worth the extra gas and lopsided wear on your econo-car’s suspension and tires. Imagine the message this will send to the authoritarian police state (traffic department) when hordes of tiny fuel efficient cars, bikes and yes even pedestrians hold fast and only make left turns. Fight the power and fill their CCTV’s with an extend blur of lefties turning left! Think about it this way, two wrongs DON’T make a right, but 3 lefts do!